Everyday will be filled with fun and free food as well as a great learning experience! About this Event Don't miss out as we travel back in time through the Bible and we'll end our extraordinary voyage with an exciting surprise. 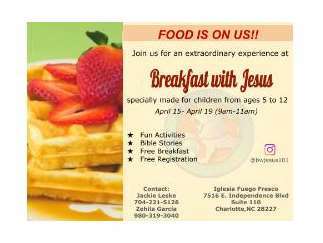 *Fun Activities *Bible Stories *Free Breakfast *Free Registration Looking forward to see you there!